In July, 2017, Thaïsa Way set out with her daughter to climb Mount Rainier. Several days and 9,000 vertical feet later, they stood together atop the 14,411-foot summit. At such heights, views verge on the otherworldly, but in that moment, Way says she’d never felt more grounded. After a decade as a historian and professor of landscape architecture at the UW College of Built Environments, she had just about mastered the long view from every conceivable vantage point. Way has addressed this question in her other roles at the UW. As founding director of Urban@UW, she leads an interdisciplinary effort to tackle city issues through research, teaching and community collaboration. 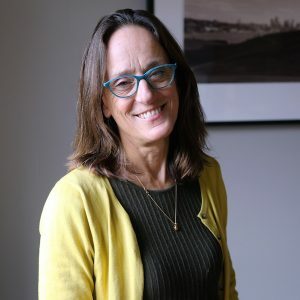 She is also on the team leading the Population Health Initiative and a member of the steering committee for the eScience Institute (a hub of data-intensive discovery at the UW) and the newly launched EarthLab in the College of the Environment. Way uses her own scholarship on feminist histories of design—particularly the role of women as professionals and practitioners—to frame questions about how landscapes foster human and environmental well-being. This, in her view, is at the core of the University’s public mission. “What a campus is, what it looks like, and how one experiences it actually matters,” Way says. Universities have the ability to create spaces that spark inquiry, exploration and shared learning within a wider community. However, Way cautions, campus spaces can only serve as a catalyst for healthful, human impact when the professors and scientists make time to share their expertise with community and civic leaders. That shift in views is reflected on the UW’s campuses today. Way points to UW Tacoma’s “totally immersive” idea of an urban campus and to UW Bothell’s integration of a suburban setting with proximate woodland and wetland as “fantastic examples” of more fully realized landscapes. Matthew Leib is the web editor and visual producer at The Whole U.